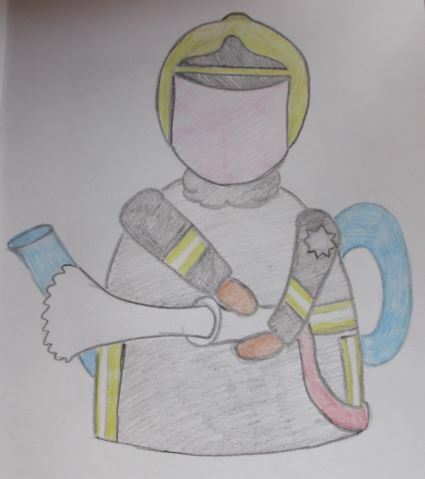 My mind is turning to my next project, and I’d like to design a fire fighter tea cosy. I want to make a fireman because the fire brigade do such an amazing job keeping us all safe and they are a British icon. Also I can’t wait to knit with florescent wool. That’s right, you can buy psychedelic wool - King Cole Big Value Neon DK. Growing up in the 80’s when florescent was all the rage, you can see why I’m excited at the prospect of knitting with it. I also think that the water gushing out of the hose is going to be a challenge to design, but will make the tea cosy. I have been researching on Google and found a badge on the left arm of some fire fighters, so thought I should include that and I shall give him a pair of orange gloves, I think the additional colour will perk the pallet up.